Woodbury Funeral Home originally began as McMillen Funeral Home and operated on McMillen St., now know as College St. The funeral home was owned by T.H. McMillen. In 1936 Mr. McMillen moved the business to it's present location on W. Main St. Mr. McMillen sold his funeral home in 1940 to Dewey Winnett, Sam Wooten and Hilton Armstrong. After 13 years of service to the community the funeral home sold once again. Claude Wilcher, J.H. Larimer and George Mayo purchased McMillen Funeral Home and changed the name to Woodbury Funeral Home. About 4 years later Claude and J.H., better known as Hal, became partners. This partnership lasted about 20 years. In 1966, Hal became sole owner of the funeral home and retained the name. Hal done many improvements including adding the chapel that we use today in 1969. This addititon greatly improved service to the community. September 1986 brought about another ownership change. Hal sold Woodbury Funeral Home to the present owner Kenny Gilley. Today you come into our building and enter into our newly remodeled facilities. 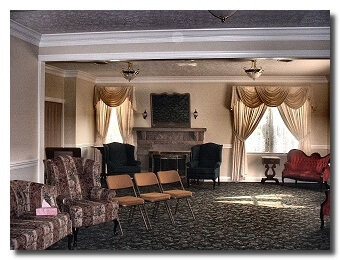 Our visitation room and arrangement offices are spacious and can accommodate families of any size. Our chapel will seat over two hundred people. The lounge area is large and will accomodate several families with each having their on private space and is furnished with coffee, plates, cups, napkins, etc. also a drink machine for your convenience. Our selection room is displayed with caskets, vaults and clothing presented in such a way that families can make their selections easily with less stress.